Conto makes it easy to manage your personal finance on a month to month basis. 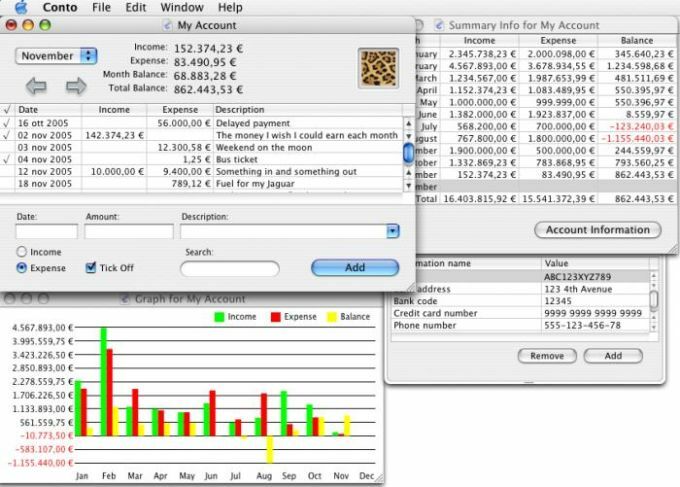 Enter all your income and expenses, sum up the differences and generate charts. The drop down menu at the top left of the interface lets you visualize your finances by month. You can also create and save new categories from the entry at the bottom right of the interface. Conto supports all major currencies, making it accessible to just about everyone and includes strong encryption to protect your accounts. If you make a mistake in your finances you can also easily undo your entry and rewrite the correct amounts. While Conto won't offer you advanced graphs and statistics on your budget, it's the perfect tool for anyone looking to handle their money on a monthly basis. Drawing histogram from your data. What do you think about Conto? Do you recommend it? Why?